After a bit of a strip down and a clean my 96 was playing up a bit. The symptoms were the bolt was very stiff going forwards and backwards, sometimes jamming up. After carefully checking the grub screws in the otherwise excellent pdi hop unit which can protrude into the nozzle grove if not careful and obstruct the last 20mm of movement in the bolt, I managed to eventually pin down the issue. 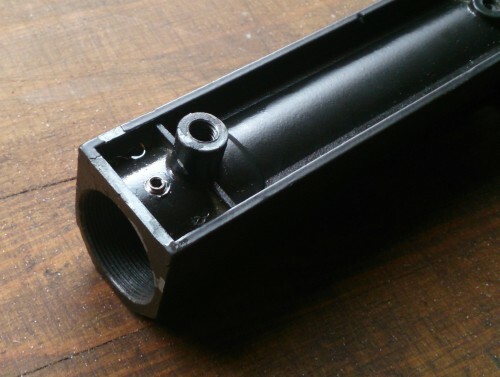 Essentially a grub screw which secures the outer barrel to breech block needed to be so tight that it was deforming the outer barrel. This was because over time the thread had worn and the screw needed to be really wound in to get purchase. 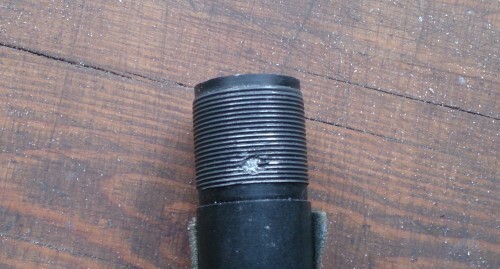 First up, a slightly larger grub screw (M3 in this case) fitted (see below) tapping the hole out to receive it. You could probably do this by just winding the screw in carefully to the block as it’s fairly soft metal. (remember to keep backing off and use lubricant – ooer missus!). Then simply cut the grub screw to length required. Whilst it was apart I grabbed a photo of the set pin mod. This failed a while ago when a stronger spring was fitted. (Originally a Well MB01, about 6 years ago!). Rather than payout £150+ for a laylax trigger block I found a piece of key steel (the part between door handles works well) followed by a bit of measuring, a hacksaw and some finishing off on a grinding wheel (a file would do just as well) and voila, you have a bomb proof set pin for about an hours work and about 2.5% of the cost! Hope this helps at some point!